OH MY GOSH! Welcome to Friendsgiving headquarters 2017. I am so, so excited to share this spread with you over the next week or so. I can’t wait for you to see some of the delicious things I have in store! We have turkey and gravy, potatoes, slow cooker stuffing and dessert and cocktails of course. As usual though, we had to start with an insane, over-the-top Thanksgiving cheese board. Or crostini board! Whatever you want to call it. As long as you have tons of bread and cheese, this is where it’s AT. The star of the show here is a maple cream and apple butter baked brie. It is to DIE for. Hilariously, even though I made this spread a few weeks ago, last night I ate some sliced brie on crackers because I’ve been in a crazy weird cheese and crackers mood. I almost actually warmed my brie up in the oven like a crazy person – I mean, just for MYSELF. Probably has something to do with being past my due date and going a little stir crazy at 9PM. I usually prefer to wait a little longer to share Thanksgiving recipes, even though I know a ton (most?) of you plan in advance. But since I took on more of a Friendsgiving theme this year, I knew we had to get going. We only have a few weekends until Thanksgiving, so hopefully your menu can get set! The difference between Thanksgiving and Friendsgiving for me is the menu. For Thanksgiving, I want plain, boring, deliciously traditional. Like crazy traditional. I say this EVERY SINGLE year and most of you agree. I don’t want cheese in my potatoes and I want my stuffing to taste exactly like my mom’s does every year. My entire family agrees and you might remember that the one year I took this butternut squash lasagna to Thanksgiving (as a side dish, mind you! Not in place of anything else!) everyone had a heart attack and refused to eat it. That’s just for the main Thanksgiving meal, you know? I’ll go crazy with leftovers and if I must (really, like it’s soooo difficult) eat some sort of secondary Thanksgiving meal, I’m okay with it being a little crazy. 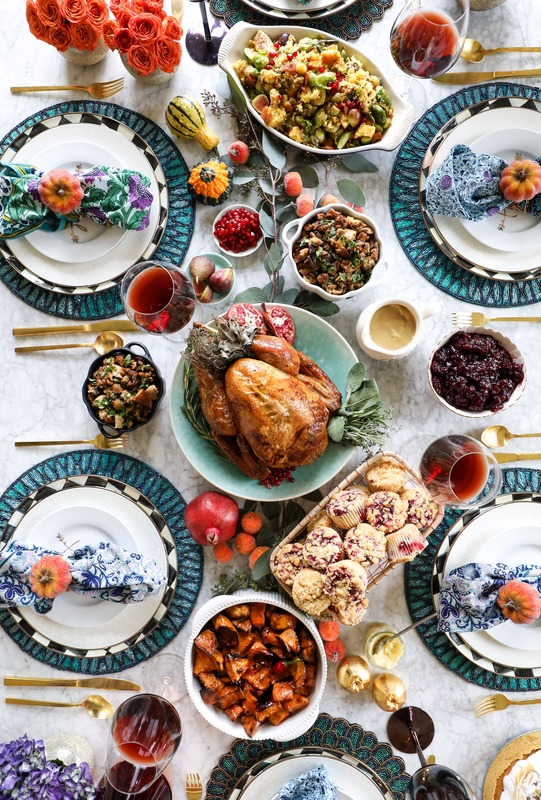 I love that Friendsgiving can be that opportunity to experiment with nontraditional, out-of-the-norm dishes that are still somewhat holiday-themed but might not fit on that table that you’ve been serving for 10 or 20 or 30 years. You know? It alllll starts with this big cheese and crostini bar! 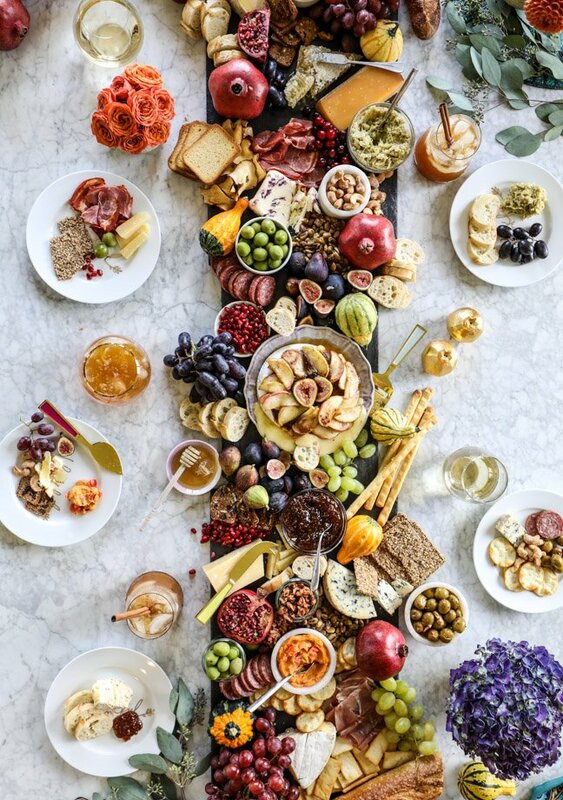 I’ve shared enough of these on the blog by now that you probably know my train of thought: find whatever cheese, fruit, breads, crackers, spreads, briney things like olives and maaaaybe even some veggies and throw them all on a board. No rhyme or reason. I’ve done my all-time favorite classic cheese board with a few different cheese balls! And last year I even made a smaller holiday cheese board with a butternut squash cheese ball. Ooooh yes. Plus, a spring and a summer version too, but those may or may not be applicable depending on where you live. One of my other favorite things to do here is to add in some seasonal produce for decor. So pomegranates! Little pumpkins! Fresh cranberries! Whatever greens you can find and maybe some fun flowers or whatever. And you absolutely don’t have to set it up LIKE THIS. Last year, I set it up on my kitchen table, but we ate dinner in our more formal dining room. In the past, I’ve even set up a card table with a tablecloth in the corner and built my cheese board right on there! Find that space you have and GO FOR IT. And! Some of go-to cheeses that ALWAYS make my cheese boards. I adore the Sartori Montemoré, BellaVitano Gold and the Merlot BellaVitano. I find mine at Sam’s Club (in large quantities! ), DeLallo Foods or my local Giant Eagle. Cypress Grove Humboldt Fog and Truffle Tremor are also up there and always on the board. Also love any form of Beemster cheese! 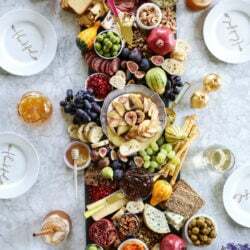 All of these cheeses are pricy, so I don’t use ALL of them at once unless I’m making a huge board like this for a party. And when I do that, this tends to be the only appetizer and/or snack. Basically, this could be my dinner. Long story long, I encourage you to make it your own and size it appropriately. If there is an appropriate size when it comes to CHEESE. Preheat the oven to 375 degrees F. Spray a baking dish or pie plate with nonstick spray. I suggest using the dish you’d like to serve this in so you don’t have to transfer it. Spread the apple butter on top of the brie cheese. Gently spread the maple cream on next. Layer on the apple slices and sprinkle them with cinnamon, then drizzle with maple syrup. Bake the brie for 10 to 15 minutes, just until it almost bursts and the cheese is melty. Drizzle more maple cream or syrup on top right before serving. Serve with lots of crackers, crostini and breadsticks! I like to place my cheese on the board first and then add in bowls with spreads or nuts. After that, fill in your empty spaces with what else you have! It will all come together as you work at it. And now, stay tuned for ten days of Friendsgiving goodness! thanks so much cate! and yes, there is always room to trash up brussels! yessss sounds like the best plan ever. I couldn’t not comment on how stunning that cheeseboard is. You nailed it. Big time. This is quite literally THE most beautiful thing I’ve ever seen in my life!! All of the cuss words flew out of my mouth at this beauty – in a good way. If I could pick one thing to eat for the rest of my life it would be this, hands down. Cheese boards for life! This is GORGEOUS! So inspiring. Maple Cream is a thing?! Oh my goodness I had no idea! I’m gonna have to try it out!! Also, amazing photos! This is like superhero-level stuff! Amazing! I just want to dive into that melty brie!!! These photos are amazing! The brie recipe…. CRAZY amazing! This brie will be presented at my weekend cocktail party on Saturday evening. YUM!! Wowsa. These are beautiful photos. The food arrangement is stunning. My mother is turning 100 the Saturday after Thanksgiving. My sister and I are throwing a birthday party for her. You just solved my menu. Since it is at the nursing home people will come and go, a cheese board really seems the way to go. And of course there will be cake. Wishing you a healthy baby and easy delivery. First I have to tell you that the photo is absolutely gorgeous and should be hung on the mantle. Now let me YELL AT YOU!! What were you doing up on a ladder at nine months+ pregnant, huh???? Oh. My. Heavens. If I’d been there you’d have given me a heart attack. Well, I’m glad all is well and that you got your beautiful table shot. My, I wouldn’t know where to start. Everything looks marvelous. Happy weekend and hopefully the little darling will be here soon. This is creative and stunning. You have raised the bar. Ahhhh!! This is incredible!! I’m so excited about this spread and all the recipes to follow! Please tell us what kind of muffins you have as part of your Thanksgiving spread, right next to the Turkey! Something cranberry-y?? This baked brie is absolutely delicious! The apple butter/baked brie combo is perfection! My family loves it. 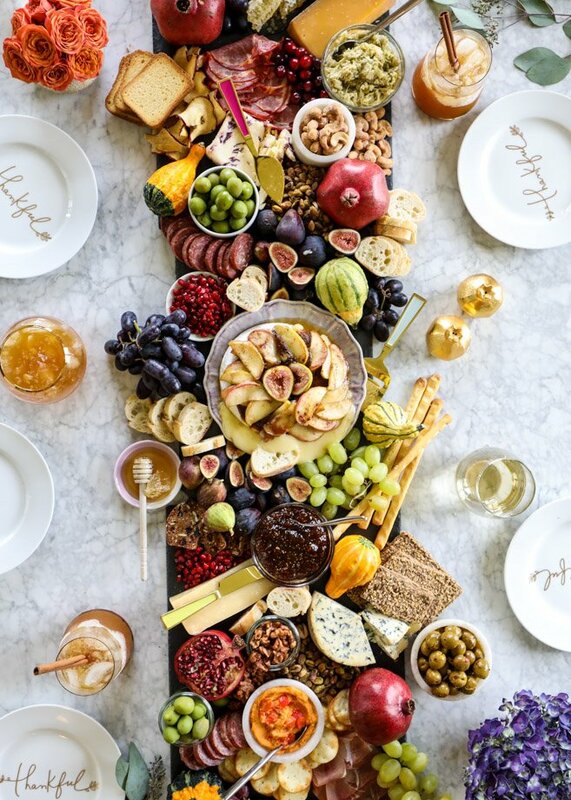 Pingback: Fall Cheese Board | .nutmeg.